In the early 1800’s, huge herds of buffalo wandered the area around Wetaskiwin. Overall, it is estimated that a sustained level of 30 million buffalo once walked the Canadian prairies and the plains of the US. This population lasted from prehistoric times until the late 1870s. The systematic slaughter of the bison by Indians and white hunters with big guns, took its toll almost to the point of extinction with only a few thousand left by 1880. Traditionally the Cree worshipped the buffalo as the giver of life, which provided them with food, shelter, clothing, fuel, and everyday tools. The importance of the buffalo herds to the Natives cannot be underestimated and was “part of their lives from the day they were born to the day of their death”. First Nations people in the West were wandering nomads who spent most of their time hunting buffalo. The bison governed their simple lives almost entirely. If the herds shrank or moved on, the Natives would move to follow them. When a herd was located they were stampeded over cliffs, or boxed in, or funneled into buffalo paddocks. They were killed by bow and arrow or spear. Later on the rifle unfortunately made it much easier. After the hunt the animals were cut up, and there was a lot of cooking and feasting. The tongue was a delicacy and the Indian woman did most of the work, “scraping and preparing the hides, and making pemmican”. Pemmican was made by cutting buffalo meat into thin strips then smoking it or drying it in the sun. It was then pounded into a powder and mixed with fat, then flavored with saskatoons or other berries. It was poured into skin containers and kept indefinitely. “Pemmican was one of the most concentrated foods known and was extensively used by white traders and trappers as well”. The First Nations teepee was made of long poles covered with the tanned and decorated hides of the buffalo, which was easily folded and carried by travois from camp to camp. A travois was simply two poles tied together at one end and slung over a horse, with other end having a net to support the load, which was then dragged by the horse. The horns of the buffalo became spoons, vessels, and handles for stone tools. Fine pieces of bone were used for needles or fish hooks. The bison in the Wetaskiwin area had “four predictable stages in their annual cycle. They rutted and calved at the edge of the foothills, wintered in the foothills, and summered on the plains”. Chief Ermineskin said that “his band wintered in the Kootenay Plains west of Rocky Mountain House. In the spring they followed the buffalo to the Red Deer and Battle River areas. In the summer they drifted along the North Saskatchewan River reaching Fort Edmonton in time to trade in the fall. They then wandered back south to the Wetaskiwin/Ponoka area before moving back west to the foothills for their winter camp”. As far a buffalo hunting by white men was concerned, there were three factors that helped proliferate the demise of the shaggy beasts. The first being an effective way to tan hides. The use of a strong lime solution for soaking the hides had not been perfected till the early 1870s. Second to this, the rifles being used were ineffective until the latter years of the US Civil War (1861-1865), at which time accurate big bore rifles came on the scene. The weapon of choice was what white hunters called the “Big Fifty”. The first Sharps rifle produced was a fifty caliber, which was loaded with a heavy ball and 90 grains of black powder. The gun was both accurate and lethal up to 600 yards. “It is no wonder the Natives referred to it as the gun that shoots today and kills tomorrow”. What this gun could do in the hands of a proficient hunter is almost sickening. 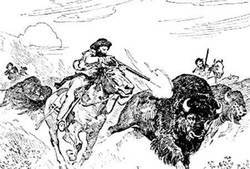 During a two month span in 1876, buffalo hunter Orlando A. Brown killed 5,855 buffalo. That averages out 97 per day. “In that killing spree Brown’s almost constant firing with his Big Fifty deafened him in one ear”. When other lesser rates of killing by other white hunters like Buffalo Bill Cody etc. are added into this deadly equation it becomes very clear why the bison herds of the West were doomed. The third development was the railroads. Once they were put in, hides could be shipped easily to far flung markets. For this type of hunter, buffalo was money not a way of life. The end of the buffalo and the influx of settlers spelled the end of a way of life for the Indians. Many of them headed further and further south after the receding animals. The Plains Indians had but to follow the buffalo or starve, which many in fact did. From 1867-1879 Indians from every tribe and band congregated in a region along the Canada/Us border where the few remaining buffalo were found. “The once proud warriors and hunters were reduced to killing their horses and dogs, to feeding on golphers and mice. The government of Canada was faced with feeding the First Nations people and trying to settle them on reserves, and training them for agriculture. Cattle, bacon, flour and other stuff was rushed to southern Alberta to help the underfed thousands”. “In the summer of 1881 the band under Chief Ermineskin hunted throughout the Hand Hills area and succeeded in killing one old buffalo”. Conditions improved marginally in the spring of 1883, and later on in the year when Samuel B. Lucas of the Wetaskiwin area began to teach the Cree to till the land and plant small gardens. So it was the sad story of a people and their way of life, and the buffalo, and the sordid past of human history right here in our own backyard. Today we have our bison farmers and protected parks where bison roam free, but gone forever are the 30 million of them that once roamed North America uninterrupted. References: The City of Wetaskiwin Archives, Wetaskiwin and District Heritage Museum, Siding 16 Vol. 1, Keith Miller (OAH), History News Network.